Lukasz Rachel and Thomas Smith have a terrific new paper on world neutral real rates. The fact that it supports a variety of arguments that I have been making on secular stagnation for the last two years may contribute to my enthusiasm but the paper breaks new ground in a number of respects. First, Rachel and Smith document compellingly the near universality of sharply declining real rates and also the length and breadth of the decline. They show the phenomenon is a very broad based 450 basis point trend decline in real rates occurring over 25 years. Framing the problem this way is significant because it shows the inadequacy of shorter-term explanations of low neutral real rates such as those of Ken Rogoff that focus on the financial crisis and its aftermath. It also suggests the need to look beyond monocausal. Second, Rachel and Smith do not find that slowing growth is the main explanation for declining real rates. Rather they attempt to quantify most of the factors that I and others have enumerated in accounting for declining real rates. They note that since the global saving and investment rate has not changed much even as real rates have fallen sharply there must have been major changes in both the supply of saving and demand for investment. They present thoughtful calculations assigning roles to rising inequality and growing reserve accumulation on the saving side and lower priced capital goods and slower labor force growth on the investment side. They also note the importance of rising risk premia associated in part with an increase financial frictions. Rachel and Smith’s work is not the last word but it is the first important word on decomposing the causal factors behind declining real rates. Third, Rachel and Smith use their analysis of the determinants of neutral real rates to predict their future evolution. Here they reach the important conclusion that there is little basis for assuming a significant increase in neutral real rates going forward. This conclusion differs sharply from the “headwinds” orthodoxy prevailing in the official community. 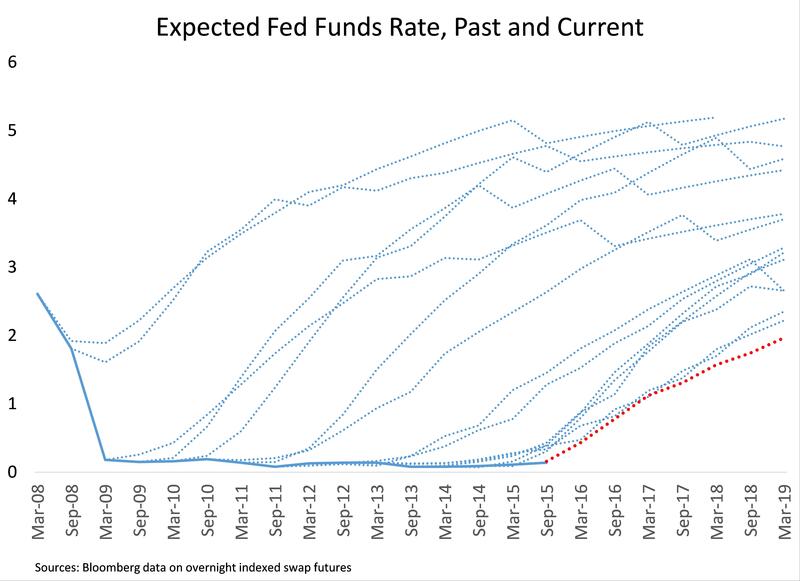 As the figure below illustrates, in the United States at least the Fed and the forecasting community has been consistently far behind the curve in recognizing that the neutral real rates has fallen. If, as I suspect, Rachel and Smith are right there will be much less scope to raise rates in the industrial world over the next few years than the world’s central banks suppose. Fourth, Rachel and Smith recognize that their findings are highly problematic for the existing central banking order. They imply that the zero lower bound is likely to be a major issue at least intermittently going forward. After all, we will have future recessions and when we do, there will be a need to drop rates by 300 basis points or more. Perhaps QE or negative rates or forward guidance will be availing. I am skeptical that they will be efficacious if a recession comes in an economy without a heavily disrupted financial system in need of repair. Rachel and Smith also share my concern that a world of chronic very low real rates is going to be a world of high volatility, imprudent risk taking, excessive leverage and frequent financial accident. We may be about to get a taste of this in emerging markets and US high yield markets. It is fashionable to invoke the brave new world of macro-prudential policy in response. To borrow from Wilde, I fear that enthusiasm for macroprudential policy is the triumph of hope over experience. In the last wave of enthusiasm for such policies the poster-child was Spain’s countercyclical capital requirements. They did not work out so well. As best I can tell US macroprudential policy as currently practiced has meaningfully impaired liquidity in some key markets and damaged the credit availability for small and medium sized businesses while not touching excessive flows to emerging markets and high yield corporate issuance. To work, macroprudential policy has to reduce financial vulnerabilities without to an equal extent reducing credit flows that stimulate demand. This is logically possible. I doubt that actual regulators who after all were proclaiming the health of the banking system in mid 2008 are capable of pulling it off consistently given the pressures they face. There are no certainties here. 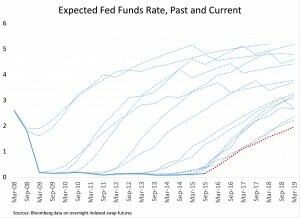 It is possible that neutral real rates will rise over the next several years. But there is a high enough chance that they will not to make contingency planning an urgent priority. That has been and is the main thrust of the secular stagnation argument. Previous Central bankers do not have as many tools as they think	 Next What Should the Fed Do and Have Done?